Adventure games are the very special sort of projects, that allow everyone to put on the mask of genius detective, solving mysterious crime puzzles. And when we are talking about really prominent detective, then everyone imagines Sherlock Holmes - one of the most famous literary character of all times. 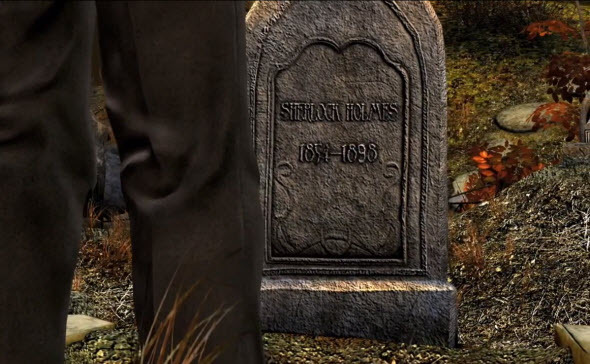 The developers from Frogwares understood that Sherlock must become the protagonist of the adventure game in the distant 2002 year, and this idea turned to be really successful. 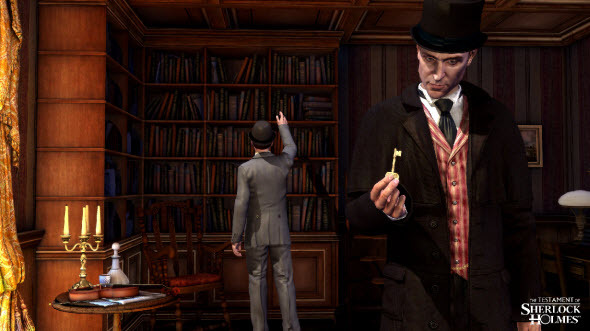 There have been five full-fledged games about this character for the last 10 years, and finally in 2012 Frogwares released the sixth one - The Testament of Sherlock Holmes. New game differs from all previous projects significantly: it became much more gloomy and dark. 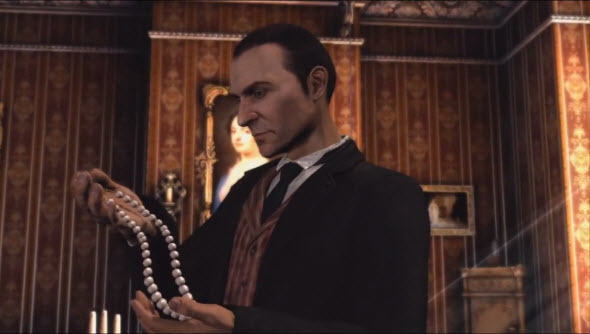 In this game Sherlock Holmes will be not only the good guy, but even the suspect in the very tangled and eerie case. You will be solving puzzles, speaking to the witnesses, pursuing the suspects and trying to find any clues in different crimes, but your hero has a lot of secrets even from you. Maybe, you will be really helping the criminal? To find out the truth, you will need to pass the long way with mysterious obstacles and difficult puzzles. The game starts with the short training course and with it you'll get your first case. Sherlock brilliantly solves the crime about the lost necklace, but the next day Watson - his best friends - finds out that the detected necklace is false. The second case is even more dark and frightened - you will need to find the murder of bishop, but as we will see, Sherlock is trying to find the treasures of bishop more, than the murder... Is our brilliant detective on the dark side? The game won't give you the answer till the end, so the tension is going to be stronger with every new level. 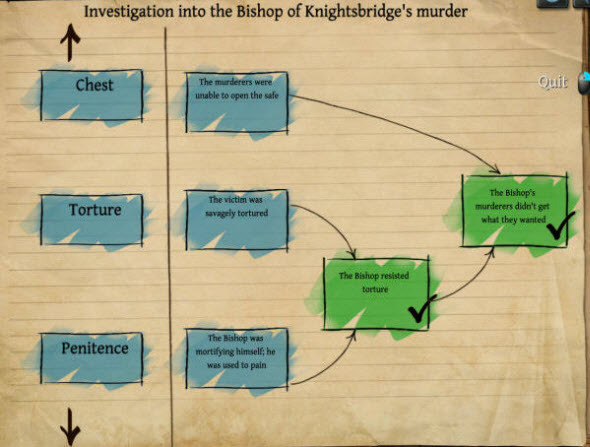 As every good adventure game, The Testament of Sherlock Holmes contains a lot of various puzzles. They will be everywhere - you won't open any door or chest before you solve the next riddle. This situations are even more than puzzles, they look like mini-games, and you will have to beat your brains for a long about them. If you have big problems with mini-games, you can skip them. 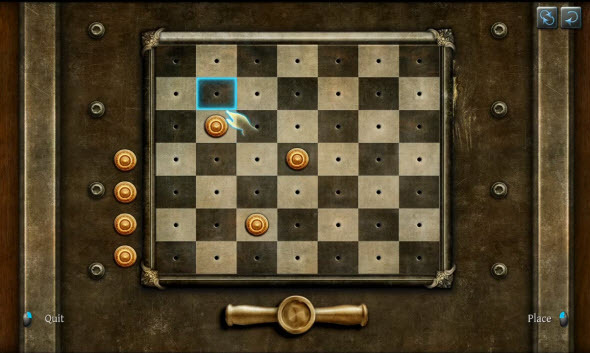 This option will appear after a couple of minutes, when the system understands, that you can't solve the puzzle. But we don't advise you to use the Skip button, because if you are not going to solve different amazing puzzles, then you don't need to buy this game at all. With all mini-games it will take you from 12 till 20 hours to come to the finish. The rest of time you will be searching for various items and clues and talking to different people. The items in the game are highlighted by the blue loupe. When you pick up the item or draw the regular conclusion, the loupe turns green. You will have to explore not only the floor, tables, drawers and walls, but also the dead bodies with disgusting and scary wounds. It will be really amazing, but we can't say the same about the dialogues with potential witnesses and suspects. The dialogues are boring, although they are voiced perfectly. To find out the truth, you will need to choose the topic of the conversation from the wheel in the dialogue's menu. By the way, this menu was developed a little bit inconvenient, because it completely covers your interlocutor. After you find some clues, it is time for the famous deductive method. Watson is putting the inferences down in his copybook, and you have to supplement this scheme with the conclusions. You will get three sentences and you will have to choose the right one. The scheme with correct answers will become green, and you will be able to continue the game. The game can be viewed in three possible modes: as point-and-click, as first person game or as modern 3D adventure. And in every mode you will enjoy the picture. Beautiful landscapes with detailed and interesting locations are really amazing, but the animation of the characters leaves much to be desired. But as we all know, the graphics is not the main part of good adventure.